We’re starting a new (hopefully regular) feature at Hotel Swimming Pools. We’ll pick a big city and then give you unique hotel pool options within driving distance–when to find the best slide, who’s got a lazy river to float, and other pool options we know you love. Since we’re So. Cal locals, we’re starting with Los Angeles. 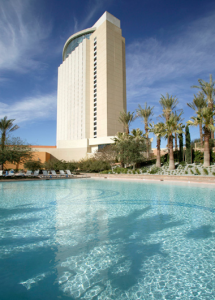 About 90 minutes by car from Los Angeles via the 10 freeway (but not on a Friday from 2 to 7pm), Morongo is an indian-owned casino resort with a surprisingly vibrant pool scene. It’s 20 minutes outside of Palm Springs, right near the Cabazon outlet malls. The pools are heated year-round and there’s a sandy-beach entrance, a waterslide, a kiddie pool, and, the best part: a lazy river. It can get pretty “sceney” here with a pool party vibe on busy weekends and maybe not so kid-friendly. If it’s midweek or off-season and you’re looking for a great pool for the kids, this just might be the place. Room rates are often discounted, but if you don’t want to spring for a room, Adults can get in for the day for $25 and kids over 3, $20. Side note: they have 4 private casitas for rent with private pools. Closest private pool option to Los Angeles? We’ll have to look into that one. Hotel pools in Los Angeles. Hotel pools in Palm Springs.